So Many Journeys is Divine reading and enjoyment for anyone interested in dance and movement, Indian culture, and more specifically the exquisite classical Indian dance form, Bharatnatyam. It's every chapter covers different forms of Bharatnatyam such as Anjali-the beginning, and Guru dakshina - the sacred relationship between guru and disciple. 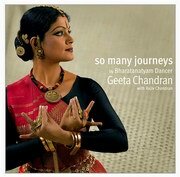 So Many Journeys is comprised of the contemporary writings on Bharatanatyam by the well known dancer Geeta Chandran. It is a compilation of the dancer's impression on her journey with classical dance. The articles are an insider's view of a difficult profession, some of the articles are intensely personal and biographical. The book is produced wonderfully, 228 Pages with 110 plates of colour moods and images.